What a glorious weekend. Warm sunshine beguiled us into the garden on Saturday. I planted out the tomato starters, but will leave them covered lightly until the last full moon in May which is the 29th. We can occasionally get a touch of frost this month if the skies are clear. Carrots, beets, and radishes were planted earlier and are emerging from the soil. The strawberry plants are full of blossoms and I mentally encourage the bees and other pollinators who busily move from plant to plant. Tablecloths or placemats? I use both, but I prefer tablecloths. I've had two pieces of printed linen in my fabric stash for a couple of years and was finally motivated to stitch them up on Saturday. I mitred the corners for a nice finish and am very happy with the way they look. A couple of weeks ago my daughter-in-law Katie was listening to a radio talk show about how dining room tables are passe because no one sits down to a meal together anymore. A number of callers responded in agreement. Katie called in and said that she was a millennial and she certainly used her dining room table. The talk show hosts wanted to know how she used it, and were surprised to hear that she and Travis sit down to dinner every night with their two young children. Katie told the hosts that it was an important time for the family to connect and talk about the day. I know that in my Foods 8 class, many students say that they don't eat together with their families and often each person heats something up in the microwave on his or her own, and no one actually cooks dinner. Is it possible that this is the future? Or the present? Do you have a dining room table? Do you use it? We eat at a small kitchen table when it's the two of us, but the dining room gets used if there are more than four people. I can't imagine being without tables to eat at. That said, Tim and I do eat dinner on trays while watching the news more frequently than we used to. I think of the meals eaten around our dining room table, and of the laughter, the discussions (sometimes heated) and the more infrequent tears that accompanied the food. I don't think those conversations could have happened anywhere else. We'll be keeping our dining room and kitchen tables. On the blog Delightful Repast, Jean gave the recipe for a Brown Butter Rhubarb Cake. The rhubarb is flourishing, so I went and pulled up enough stalks and made this cake. It's SO good, with a buttery taste and very tender crumb. And not too sweet. YUM! I like my cake plain, but you could certainly have yours with ice cream or whipped cream. Lilacs are at their peak in my garden just now. I picked a big bouquet and put them into a crystal vase (after smashing the woody stems with a hammer to help with water absorption), and placed them on my dining room table. The sweet scent fills the living and dining rooms. Rhubarb is flourishing, right now, and I will try the recipe. Thanks. And thank you, also, for blogging. May be if it is a family thing on both sides then it is a tradition that will often continue. I am pleased that my grandchilden have all grown up sitting together at meal times throughout their younger years. I must admit that these days we only use our large table when all the family are present. Your flowers are lovely, I can just imagine the drifts of lilac scent drifting throughout your home. At the moment, here too, the garden colours are predominately purples to mauves and pinks. We have always eaten, with or without children, at a table. Even now in a much smaller house, we eat at the pine table in the kitchen. I find the habit of eating 'on the go' quite disturbing. It's lovely to talk and exchange thoughts together over a meal. How beautiful your lilacs are, I could almost smell them. 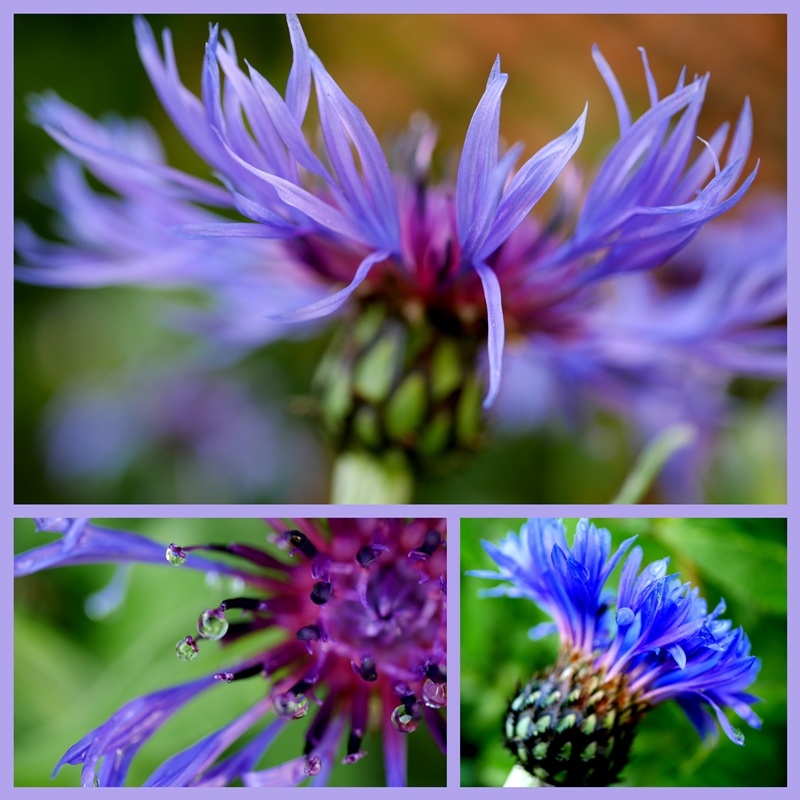 Loved this post, gorgeous photos, love your lilac(!) and so interesting and thought provoking. Where do we dine, now that is a good question! We do have a dining room but only use the table in it either for a special dinner a deux (anniversaries/birthdays or when we have visitors. We sit and eat breakfast and lunch on opposite sides of the big coffee table in the sitting room, usually doing a Sudoku puzzle with fabric placemats and napkins. We always eat our evening meal at a small side table in the family room whilst watching TV, again fabric placemats and napkins. It's all very casual and relaxed at our house! The lilacs look really nice displayed like that on the table. We have a dining table and we do use it every day, mostly together as a family. What a wonderful post! We had a grand weekend too, but I envy your lilacs! Mine have not bloomed well at all this year! They do smell so good! Have a grand week! Lovely. I'm going to cut some lilacs today! I love cutting flowers and using them into the house! prefer tablecloths, too, if I did whatever trick you are doing on yours. to put the thing out. It’s huge! We have a beautiful view from our dining room. So, we eat there often, even for breakfast. The only difference; I use place mats for casual and a tablecloth when we have guests. During the summer months we mostly eat outside. My lilacs are beginning to bloom. Lilac Sensation is always the last to bloom but the one I bring into the house because of its heady perfume. It's all so pretty! Perfect way to start a Monday morning - beautiful flowers and linens! What is the flower in the top mosaic? Oh, and the lilics, how I wish they grew here. All just lovely! Lorrie, thank you so much for linking to my rhubarb cake! AND thank you for writing about families eating dinner together at the table--most important! We always, without exception, have dinner at the table. Growing up, even my dysfunctional family of 6 had dinner at the table; so ANYone can do it! :D Loved the story about your daughter. It is exciting to see veggies start to grow in a garden. We do sit at the table a lot, but also sometimes dine in front of the TV. When we were raising our children we ate dinner every night together at the kitchen table. You are a marvelous photographer, these pictures are gorgeous. Wishing you a sweet day. Your lilacs are beautiful. I can't grow lilacs here. When I'm asked what I miss about living in New Mexico, one of things I say is "lilacs" (bearded iris, too). It's a long list ... Ha! I do use my dining room table when it is more that just me. Otherwise, it is the table just off the kitchen. I do have tablecloths (love yours), but usually just use placemats. Beautiful flowers and sounds like your veggies and strawberries are coming right along. Does anything taste better than a home-grown strawberry???!!! Happy Monday! Love the first mosaic! So pretty! I also use both tablecloths and placemats. I have a dining table, but I only use it when I have company. I find it sad to think that families do not eat dinner together. So many lost opportunities to connect, to share, to relay family stories and values, to discuss. I am glad that there are young people like your son and daughter-in-law who understand the value of the family table! We have been enjoying meals out on our sun porch now that Spring has finally sprung! Love tablecloths and yours are very pretty. I have fought sitting at the dining table for evening meals all my marriage. Finally this past year I have given in, sadly! I hate sitting in front of the TV with my meal on my lap. The rhubarb cake looks oh so good. I must go get that recipe and try it. I use to not like rhubarb, but for some reason the past couple years I have developed a liking to it. Your tablecloths are very pretty, Lorrie. We don't have a kitchen table anymore, but use the dining room table. It is quite small enough for two without the leaves, but expands to seat 12 to 14. I remember taking a field trip to a restaurant in Chinatown with my daughter's Grade 7 class long ago. She went to a private school and I was shocked at the number of children that didn't know how to eat at a table with others. They had no idea of how to ask for a dish or how to pass a dish, family style. Most said that they'd never eaten as a family - and that was in 2000! Gorgeous photos and that cake looks wonderful! I think it is so sad that families do not sit together for meals and enjoy the companionship and the sharing of their day. We always sit up at the table with both cloth and mats for most meals. It is something that my own girls and their little families now do too. Good for your daughter-in-law! I think it is so sad that families don't enjoy meals together. But it isn't a new thing -- Our children are between mid-50s and early 60s in age (not at all sure how that's even possible ))....but I remember many instances of their sleep-over or after-school drop-in friends being surprised that we all ate breakfast and dinner together at the table. I felt bad for the kids then and still do. That said, I also have no idea how we managed back then, especially breakfast for 6 (or more) on a work morning. Certainly couldn't pull it off now. Thank you for the lilacs! I'm lilac-deprived down here in Florida and I appreciate the memories and the beauty! It's so important to take time and sit down together at meal times. Your lilacs are just lovely. Your lilacs look so beautiful, Lorrie, and I'n sure their scent is intoxicating! I do have a dining room table and use it often when our entire family is together. In fact, often wish I had an even longer table! We always dined together as a family when raising our children, and my children do the same with their children, so there are still families enjoying each other's company.I do admit that sometimes the TV news is on in the background if it is just my husband and myself, but never when family or friends are eating with us. Well, this explains a lot. How do children learn to converse, not to mention table manners, if they don't eat meals at a table with other people? OK. I will calm down now. My hubby and I still eat dinner together every night at the table, with placemats! It is a time to slow down, talk, and appreciate his cooking! I have very fond memories of rhubarb, raw and cooked, so I will have to look at the farmer's markets for some! Beautiful mosaics. Lilacs are so lovely right now. I love the dining room table and tablecloths. It is true we eat less often at the table but whenever family comes together we set the table. Hope your week is going well. That is very interesting about the dining tables ... and it also makes me sad to think that eating alone, whenever, is the norm for so many. I know that when my daughter and son-in-law first got a table, I went out to get chairs with her. My son-in-law was not too eager, he figured they would be sitting by the coffee table in front of the TV anyways. Turns out, after four kids, they make time to eat as a family at the table... and it makes me happy, I don't think he even remembers having said what he said. We know how important it is for kids to feel like they belong and that there is a safe place to talk about their day. How wonderful to get to your stash of fabric, Lorrie, and make such pretty tablecloths. Since my son is still here with me, we eat at the kitchen table every evening, with either placemats or a tablecloth. When the weather is nice, I go out on my patio, and have my lunch. It's a special oasis for me. When I have big groups, we always use the dining room table. I have lilac envy right now...at least I can imagine their scent from when I had them in Ohio and Michigan. Happy Mother's Day blessings to you, Lorrie! There are so many positive things that can be said about a family meal around a table each day. It's even proven that children are more intelligent because of the conversations that happen around the table. It's a sad, sad thing to see it disappearing from American life. I'm wondering, too, about how nutritious means are that are just popped in the microwave, each in his or her own. I like your tablecloths. I've also heard they are "out of style" but I like the look and the way they protect the table. We also eat in the kitchen when it's just us or two others. 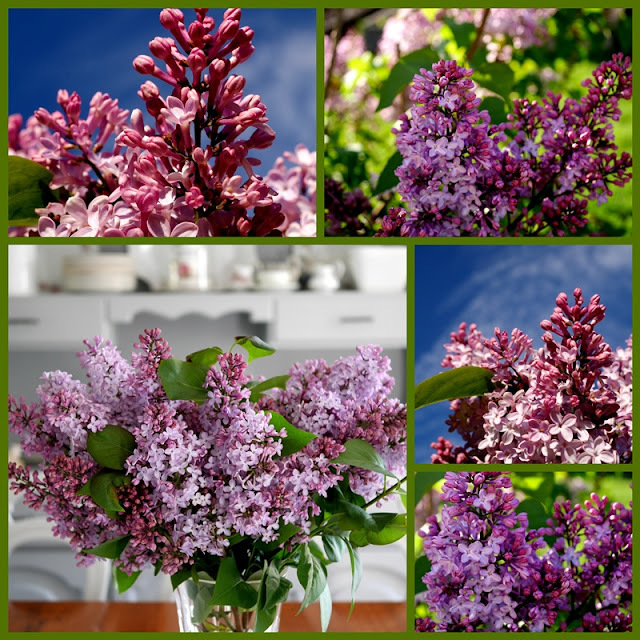 Beautiful photos of your lilacs! *sigh! * There's so much spring beauty in these photos, Lorrie. I too envy you for the gorgeous lilacs! Eating together happily, around a big table, is among the best things in life and I wish all children could experience it. Dining room tables may be slightly out of date in Canada or in Finland, but in Italy surely not. Thank you for the interesting post and happy spring days to you all! What gorgeous lilacs! Our family sits down together for meals several times a week. Devices are not allowed. It is so important for staying connected. Steve and I eat breakfast at table together. He is already eating his lunch on the patio, but it's not quite warm enough for me to eat there. Dinner is always at the table with candlelight. It's kind of silly this time of year as the sun sets later and later each night, but it's a ritual we have observed for our 47 years of marriage. My daughter, her husband and baby eat at the dining room table every night. It's a challenge for them, but they like the ritual. My son and his wife on the other hand eat out most nights, but when they do eat in, they sit at the dining room table because it has an ocean view.